Mid-Week Comfort Food | Food E.
Sometimes when things are stressful in life, in work, whatever, I come home and I want to cook but then I see the loaf of potato bread, the jar of peanut butter, and the ripe banana and I think, “Mom would totally let me have this for dinner right now.” This sandwich is a glorified and indulgent take on your standard PB&B (that’s peanut butter and banana for those of you not so quick on the uptake) and is more dessert than dinner but why the heck not? The recipe is simple and the results are faaaantastic. Just make your standard peanut butter and banana sandwich to start. Next, melt 2 Tbsp of butter in a frying pan and fry the sandwich on both sides for around 4 minutes, or until the bread browns. In a shallow plate, mix together 2 Tbsp of sugar and 1 tsp of ground cinnamon. 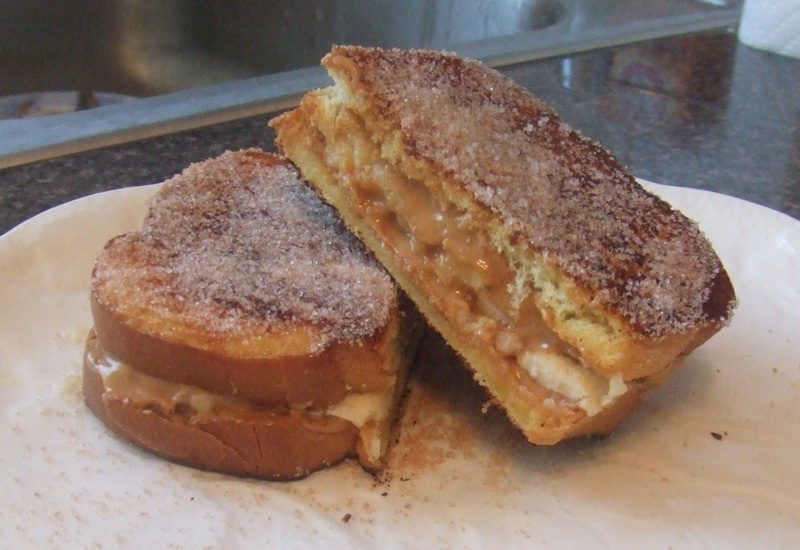 Once your sandwich is fried, dip it in the cinnamon sugar so both sides are coated. And voila. Now… isn’t that better?